Developed in conjunction with the leading screw anchor / helical pile installers around the world. 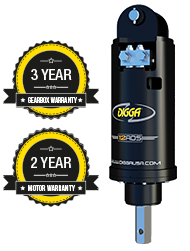 The only true anchor drives available, designed and manufactured inhouse by Digga, specifically for the rigours of the application. Host machine operates in the most efficient HP range, minimizing wear & tear, optimising performance, and ensuring highest returns. Overall length (in) 37.2" 37.2" 37.2" 37.2"
Diameter (in) 11.4" 11.4" 11.4" 11.4"